In the last month of September, I was invited to attend this event of 'Cream of Europe' that initiated by National Interproffesional Center for the Dairy Economy ( CNIEL ), France and Campaign Financed with Aid from European Union. The event was held in Almond Zucchini Cooking Studio, the place that I always like to go! Question : Why the European Cream ? European creams are subjected to an exceptionally high standard of quality. Do you know that the term 'cream' in European Countries is only used to refer to a dairy product with a minimum fat content of 30% and about 6% of non-fatty ingredients such as protein, lactose and trace minerals! So for the event Chef Gerald A Maridet making this 3 desserts using the European Cream. First is Gateaux de Voyage or they called it the 'traveling cake'. This cake has nice layers, and I love the sweet and sour taste! Next one is Religieuse with Paris-Brest Cream. Oh my..... this was sooooooo good! Loving the nutty cream filling!! And the last one is Autumn Candied Apple. This one Chef Gerald made it with 'Microwave Cake', Coffee Cream Brulee, and Candied Apple. Gosh... this one also perfect ! The bitterness of coffee flavor balanced with the sweet soury apples, and the microwave cake added the textures! And then Chef Putri made this Black Glutinous Rice Naked Cake. It is so pretty isn't it ! Usually we know 'Bolu Ketan Hitam', now chef Putri made the modern version of it! And also, Carrot Cake. This one has strong spice taste. Loving it ! Overall, I had a good time at this event! 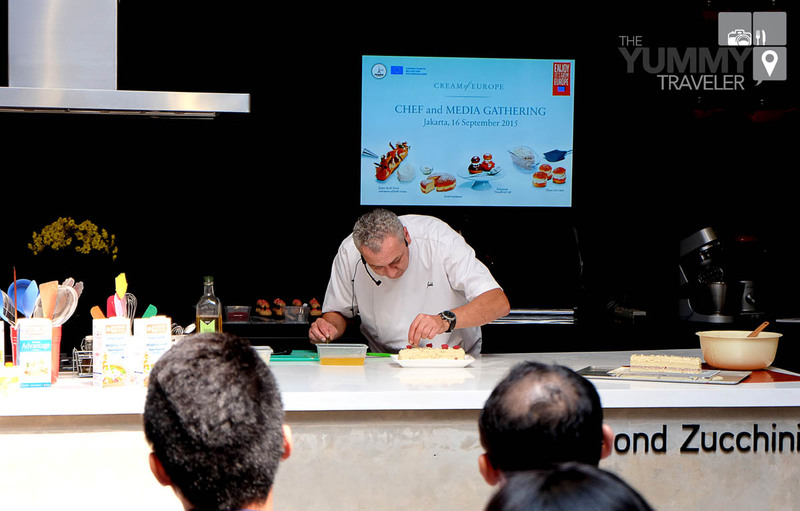 Always loveee watching the cooking demo from the skillful chefs, so I also could learn something new. Thank you 'Cream of Europe' !